This page is a collection of some of the comments from my past and present "clients" Friends. 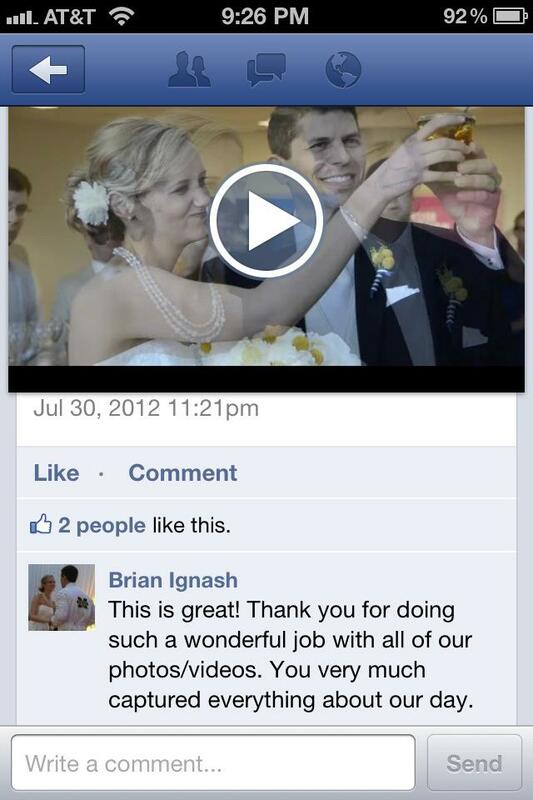 Mr & Mrs Whitmore review Kenneth Light Studios, a day in the studio while watching their video for the first time, Tears are present and mean I did my job. Mr. & Mrs. Wicks review Kenneth Light Studios, again tears present and that just means I did my job well, they came back for baby photos also. Peter was amazing! He was so warm, friendly and professional. The pictures he captured at my wedding were WONDERFUL and turned out better than I ever dreamed. I highly recommend Peter to anyone who needs pictures. I can't praise him enough! ....I am speechless!!!! You did an amazingly outstanding job!!! I'm not sure what to say, except for you're a WOW photographer and I am so glad we met. Such a pleasure, and had so much fun with you guys on the shoot. Working with Peter is a wonderful experience! I had the pleasure of sitting for them and the photos that emerged from our session were absolutely amazing. As a professional singer, I needed just the right pictures for marketing materials and other websites and I cannot express all the compliments I get on my photos from Kenneth Light Studios. Whether you are getting married, in need of a professional look for your own business or just updated family photos, I guarantee, you will not be disappointed in the artistic work you'll receive. Peter greeted us as his own personal friends from the first time I spoke to him on the phone to the minute we left his studio. Peter was extremely professional and our session was truly enchanting. He allowed my son to express a side to him I had not realized even existed. I have had many compliments on his work, and I am glad to brag on his exceptionally talented gift of photography, with a special twist in public relations. Thank You again Peter for everything. It was by absolute chance two days before my wedding day I ran across a model who referred me to Peter and Sherri. That very evening, just three short hours after I made my first, desperate phone call to the studio, they had me laughing, sharing stories and completely at ease at Panera Bread-where we covered a broad spectrum of topics from dogs, military histories to-of course- wedding ideas. The artistic talent that sets them above competitors is so obvious within any of the portfolios, but it is not the only unmatched characteristic the studio possesses; Peter and Sherri share an uncharted delight in pleasing the customer- even one who calls them at 4 PM on a Friday afternoon! Updating, checking in, even traveling over three hours away a day ahead of schedule, they made the photography portion of my wedding weekend seamless. I cannot think of words to explain the sheer joy and comfort they have given to us at the most important time in our lives by producing photos that capture our love and excitement with the rare quality of absolute excellence. Very flexible, and willing to take time to be patient with all of the guests and family. I appreciated so much that he recognized and repeated to me, 'this is Your day!' He really made me feel special. Thank you so much for making my wedding ceremony and engagement pictures so special! I am amazed by the pictures, and in awe of the artistic ability you have, God knows you had to work with what you had with me! LOL Nah, seriously you did a great job in the angles and artistic side that I SO much appreciate. I would recommend you for any photo shoot!! We had family pictures for my husband and I and our 4 year old twins done, as well as their 4 year old pictures. We found Peter to be extremely professional and courteous. He works well with adults and children alike and even had our kids laughing and acting like themselves during the 'shoot'. I hate to have pictures taken of myself and actually found myself feeling comfortable with Peter. We were very pleased with the final results and had them back in plenty of time for Christmas cards to go out (the shoot was the week of Thanksgiving). We found Peter's prices to be reasonable and actually ended up ordering more later. We will definitely go to Peter in the future and would recommend him to anyone looking for a great photographer. I rarely take the time to write reviews but in this case I simply had to make an exception! Peter is a phenomenal photographer and a consummate professional, his attention to detail along with his endless creative vision really set him apart from the rest. He didn't just use a "cookie cutter" approach when dealing with our wedding, he took the time to meet and get to know us so that he could both define and exceed our expectations. He really knows how to bring out and capture the best in his clients, we would definitely use him again! For all your Wedding needs, Photography, love Stories, one of a kind Movie Posters, and much more. As a Wedding Photographer in Basingstoke Hapshire I love what I do and to bring new innovative ideas and products to my brides, its what makes this special.